M94(NGC4736), The 'Cat's Eye' galaxy. I find these ring type galaxies particularly beautiful. This one was discovered by Pierre Mechain (he seems to have discovered everything!) on 22nd March 1781, it lies in Canes Venatici, near the star Cor Caroli and is thought to be anywhere from 15 to 30 million light years away. It has a very high dynamic range, much more so than M42 for example, meaning that there is a really big difference between the brightest and darkest regions, so it's very easy to burn out the core and central detail when trying to bring out the faint stuff. 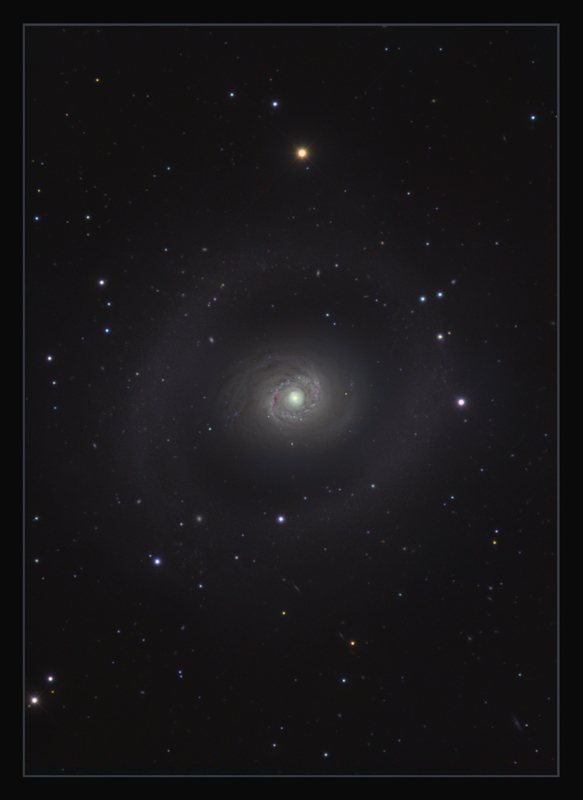 The core of M94 is really bright, the immediate surround a lot less so, and the outer ring is incredibly faint and needed hours of long subs to bring it out. The core is made up of 60 second subs which were then dropped into the surrounding image, and lots of careful stretching and masking using layers has been done. .I shot about 4 hours or so, and did a quick process, but couldn't stretch it far without noise becoming an issue, so just kept adding more and longer subs until it was useable. I could have stretched the surrounding ring more, but even after over 15 hours of luminance data, it would have become noisy, so I left it where it is and hopefully kept it looking natural, and am happy that I've managed to catch a bit of detail in the region. I may well throw some more time at it next year. This is a 'starburst' galaxy, meaning that it has active regions where star formation is occurring very actively. These are thought to be caused by gravitational pressure waves. The main one can be seen as a ring of red around the centre, which I highlighted by adding H-alpha data to the red channel. Until recently, it was thought that M94 was a classic ring galaxy, but it's now known that the outer ring is actually spiral arms, just very faint. For some reason, no dark matter surrounds this galaxy. Imaged on 10,11,13,19 & 28th February & 10,13,14,15th March 2010 from Dorset with a TMB152 @ F8 and Atik 16HR. Total imaging time. 23 hours 23 minutes.